Each week we pick our ten favourite lots from an upcoming auction. 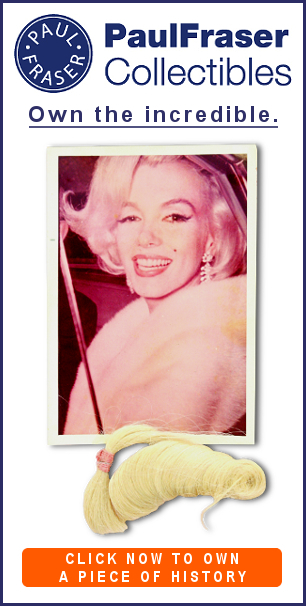 Our featured sale this week is Heritage Auctions’ Americana & Political Signature Auction, which takes place in Dallas on May 4-5. An original button worn during the inauguration of U.S President George Washington at on April 30, 1789. This remarkable 230-year-old gilt brass button was one of several designs produced to commemorate Washington’s historic inauguration, and features his initials “GW” along with an engraved liberty cap. A pair of leather flying goggles worn by the pioneering aviator Charles Lindbergh. Although the exact history of the goggles is unknown, the fact that they were retained by Lindbergh’s wife Anne Morrow Lindbergh after his death in 1974 suggests they may have been worn during a significant flight. Anne later gifted the goggles to her physician Dr. John Lattimer, a noted collector of historic memorabilia, and in turn they passed to a close friend and fellow collector in 2007. 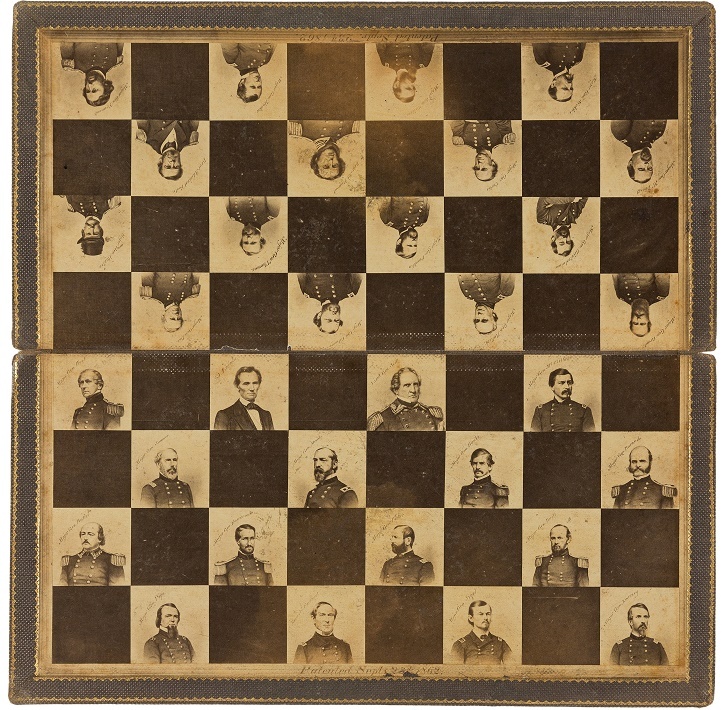 A pictorial Civil War checkerboard, patented in 1862, featuring white squares depicting President Abraham Lincoln and various commanders of the Union Army. 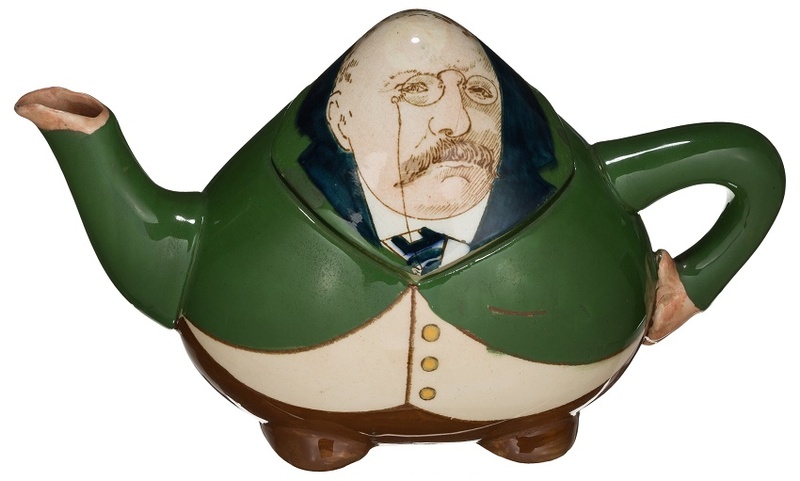 A highly rare ceramic caricature teapot depicting U.S President Theodore Roosevelt, one of only two examples known to exist. 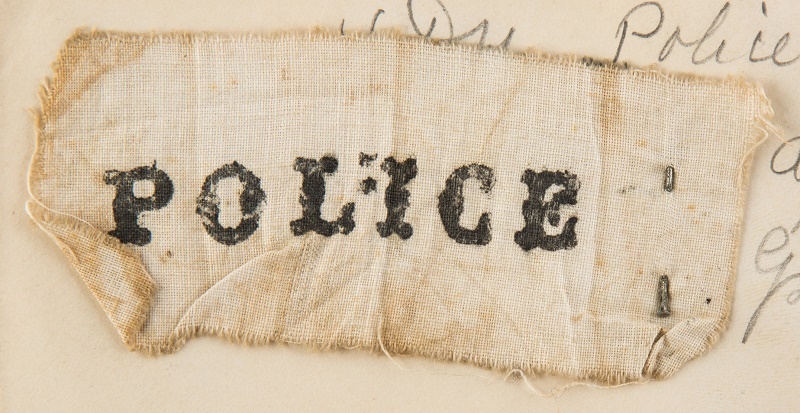 A rare surviving ‘POLICE’ patch worn by civilian deputies during the Great Fire of Chicago in 1871. On October 8, 1871, as fire broke out and swept through the city of Chicago, Mayor Roswell B. Mason placed the city under martial law and the control of General Philip Sheridan. To help fight the fire and keep the peace, Army officers deputized civilians across the city, and according to accounts one young man printed up muslin patches with the word “POLICE” that these deputies pinned to their jackets. Although the fire killed up to 300 people, and destroyed the homes of 100,000 more, the army and its deputies did their jobs well and disturbances such as looting were kept to a minimum in the days that followed. 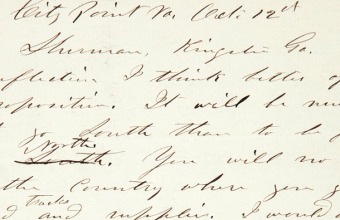 The two items originate from the personal collection of Captain Frederick Benteen (1834-1898), the notable military officer who fought during the American Civil War and served alongside General George Custer during the Indian Wars and at the Battle of Little Bighorn. 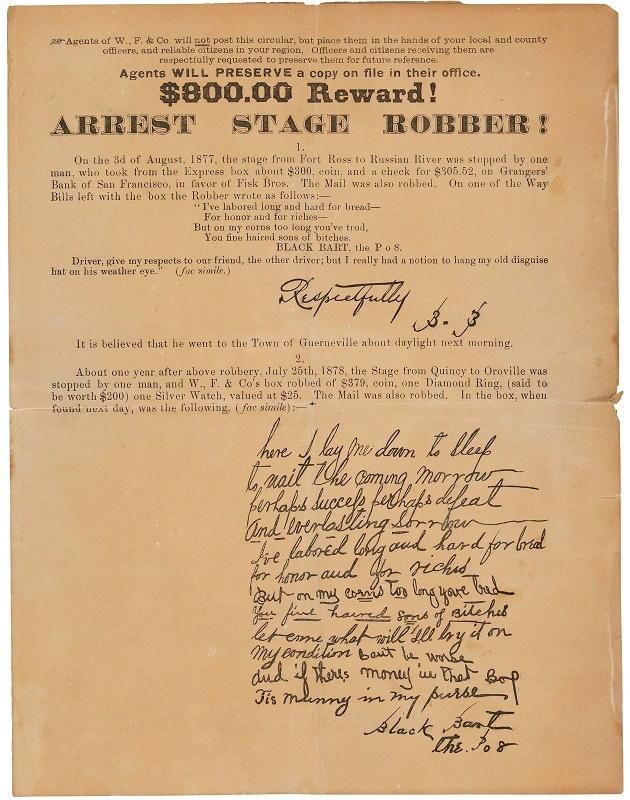 An original 1882 Wells, Fargo & Co. circular offering a reward for information leading to the arrest of the infamous Old West stagecoach robber ‘Black Bart’. Bart was in fact the Englishman Charles Earl Bowles, who served in the Civil War and was wounded at the Battle of Vicksburg. After his discharge he became a gold prospector, but according to a letter to his wife in 1871 he had an unpleasant encounter with two Wells Fargo agents and vowed revenge against the company. Between 1875 and 1883 Bowles robbed Wells Fargo stagecoaches at least 28 times, and earned himself a reputation as a gentleman bandit. Bowles never fired a shot during his criminal career, and left two poems at the scenes of his robberies, one of which is also printed in facsimile in the circular. He was finally captured in 1883 and jailed for four years, before disappearing upon his release – but his poetic nature and his stylish, non-violent methods earned his a reputation as a true Old West folk hero. 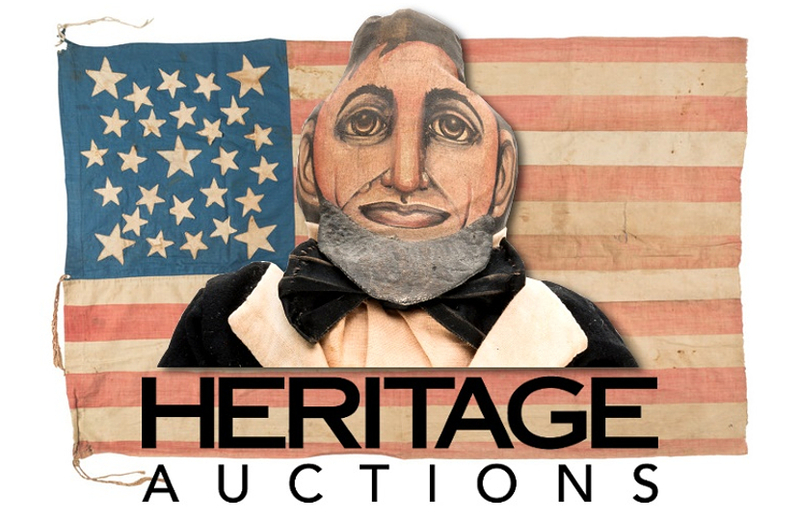 A unique, large and highly detailed folk art doll of U.S President Abraham Lincoln, believed to date from the Civil War era. 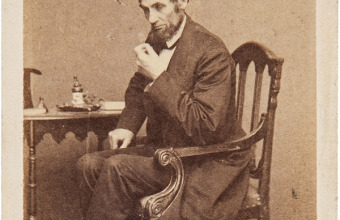 During the U.S election in 1864, Lincoln’s opponents often burned effigy dolls of his likeness at political rallies. 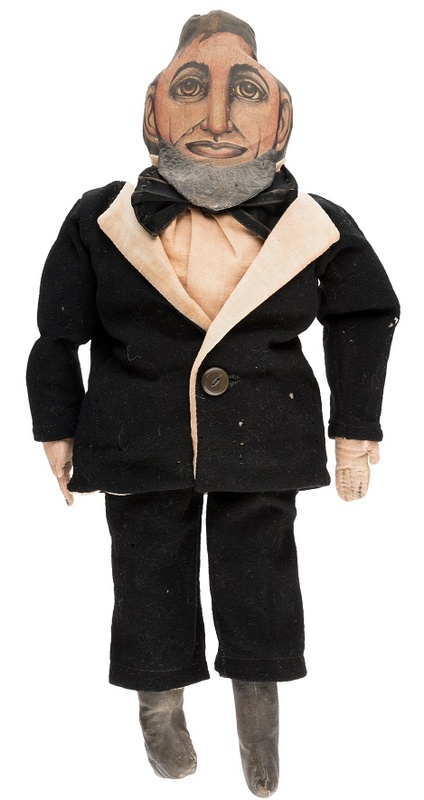 However, the time and effort that went into this doll suggests it was likely made by one of Lincoln’s loyal supporters, and was not intended for the bonfire. 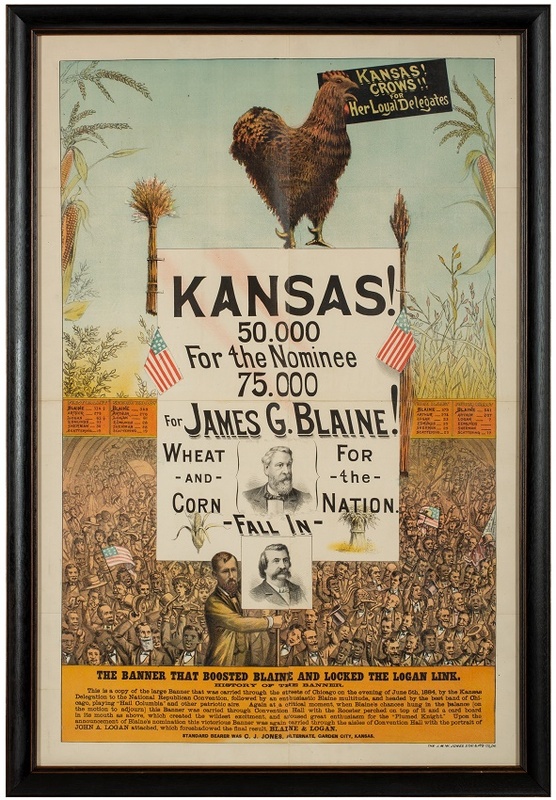 The poster was produced to honour Kansas delegates at the 1884 Republican National Convention, and their support of the eventual nominee Blaine who defeated the incumbent president Chester A. Arthur. According to Heritage experts, the poster is the only example known to exist and was previously unknown to even veteran collectors. 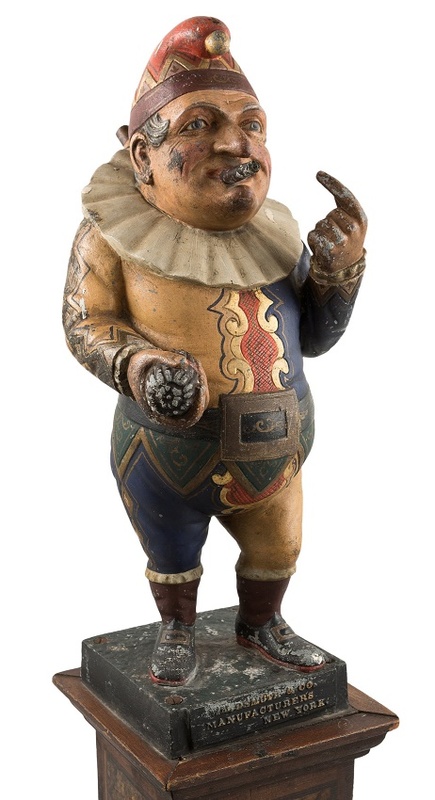 A highly rare cigar store figure depicting Punchinello, dated circa 1885. The figure was produced Wm. Demuth & Co., a renowned New York manufacturer of carved wooden pipes and cigar store trade figures. In 1863 the company expanded its range to include metal trade figures, which could withstand exposure to the elements better than their wooden counterparts. The majority were traditional Native American figures, but Demuth also produced a few exceptions, including an Oriental Girl, Gambrinus – a mythical figure associated with beer – and the rarest of them all, Punchinello. This example retains much of its original paint and patina, along with the character’s cigar and the original tubing which allowed it to produce puffs of smoke. 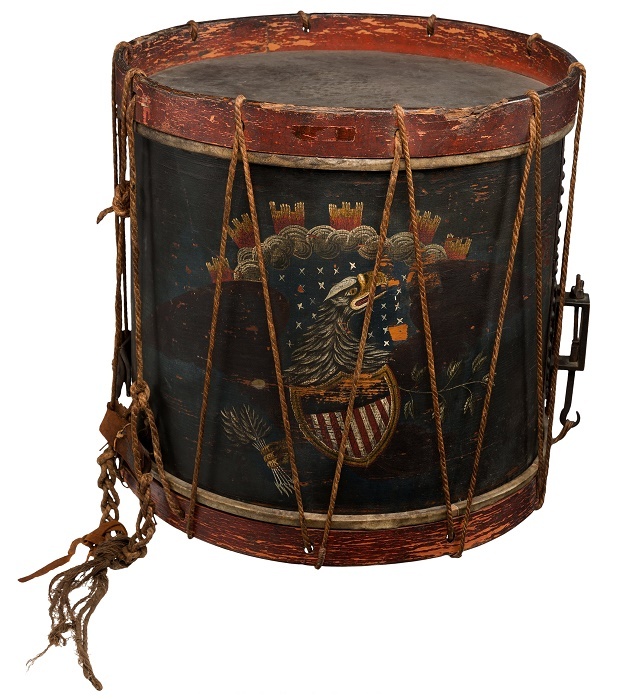 A historic U.S Army drum owned by the celebrated military drummer Jordan B. Noble. Jordan B. Noble was born into slavery in 1800, and at the age of 14 he joined the 7th U.S. Army Regiment as a drummer. In January 1815 he played a pivotal role in the Battle of New Orleans, as his drum beats were used to convey orders to troops during the chaos of the British assault on the city. His heroism during the battle earned him the nickname “The Drummer Boy of Chalmette”. 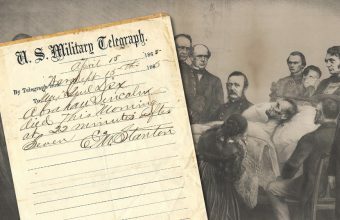 Following the end of the War of 1812, he continued to serve as a military drummer in the Seminole Wars, the Mexican-American War and the American Civil War. In his later life he returned to New Orleans and became a notable figure around the city, often participating in parades and playing his original military drum. Noble acquired this drum prior to his service in the Seminole Wars in 1836, and continued to use it until his death in 1890. It was displayed at the 1904 World’s Fair in St Louis, and then spent more than 100 years as an exhibit at the Louisiana State Museum.